Race Cozy Corner: Who Needs a New Stair? Who Needs a New Stair? Thinking about your stair set isn’t something most people do too often. You never think about it until you need to do something with it. If you had a quality builder build your house you might never have to do anything with your stairway. It will be there for you through thick and thin until the end of time. If you however have bought an older house or need to do some remodeling you might have to take extra time to think about your staircase. Sometimes it might just be time for a refresh. A good place to start with your new stair way is your newel post. This can be the basic sturdy corners you need. A good post will hold your handrail in place and make the rest of your project go very smoothly. There are a lot of different styles of posts so it comes down to your personal preference when you are picking one out. I like the twisted posts myself but there are many that aren’t as excited about a twisted post. 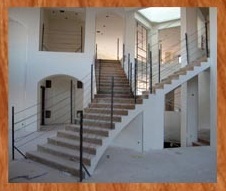 There are solid posts that will look good with just about any type of staircase you are building.